Last night saw Roger Federer entering his first Grand Slam final since the 2015 US Open and his first Australian Open final in seven years after defeating Stan Wawrinka in an epic five-setter semi-final which lasted three hours and four minutes. In the final, Federer will play his longtime rival Rafael Nadal. Federer’s victory over Stan Wawrinka made him the oldest Grand Slam finalist since the legendary Ken Rosewall in the 1974 US Open at 35 years and 171 days. However, Federer and Rosewall haven’t been the only players to have reached a Grand Slam final in their late 30s and this has been written to point out five oldest Grand Slam finalists of the Open Era. Andres Gimeno was one of Spain’s finest players during the 1960s and mid-70s but he could not display his full potential at the Grand Slam level due to the fact that professional players could not participate in Grand Slam tournaments. He did not play much during the Open Era as he was already in his 30s. 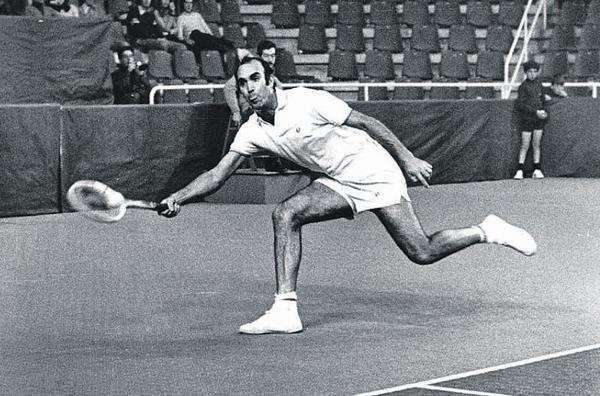 However, he did win a Grand Slam in the Open Era at the 1972 French Open. Gimeno was the sixth seed and had a good start to the tournament, winning his second and third round matches in straight sets before being pushed to five sets in his fourth round match against Clark Gaebner. In the quarter-finals, he defeated third seed Stan Smith in four sets before surviving a scare from 10th seeded Soviet Alex Metreveli in the semi-finals. He defeated ninth seeded Frenchman Patrick Proisy in the final to win his first and only Grand Slam. At 34 years and 313 days, Gimeno was the third oldest Grand Slam finalist at that time, after Ken Rosewall and Mal Anderson.